The experienced Copnor E outfit were too good for Craneswater Dandy as they retained top billing in group D of the Peter Rook Cup. Derek Foster, Pete Rook and Stacey Wearn put the home side six up, writes Graham Simper. Then Brian Elsegood hit back to stop the inevitable. Phil Ledington and Rob Dandy left it at 9-3. Steve Toms made sure Copnor A stayed on maximum points as he hit a handy 52 to help towards an 8-4 win over Al’s Club. Scott Compton, made a 37, Mark Tillison, added a 32 break, and Mick Hall was also on song to rub out a great opener from Paul Ashmore. Andy White and Pete Parsons made sure Craneswater R broke their duck with an 8-4 win against Leigh Park. Waterlooville D got up and running with a comfortable 8-4 success at North End Bowls. Mike Dorey and Ian Pledge served the bowlers well. But the Aston Road gang were in charge throughout. Daniel Harvest and Darren Harper shone early on before Steve and Harry Wilson completed the scoring. Gary Churchill gave Cowplain Gas a decent start against Bellair in group A. However, the luck soon ran out as the Havant outfit notched another win to top the chart. From 3-1 down Lee Harding, who made breaks of 33 and 34, Greg Jones, with a 38, Phil Skinner and Rob Henley took the score to 9-3. 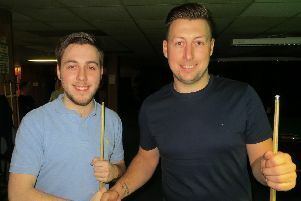 Steve Hughes preserved the unbeaten record of second-placed Cowplain Z with a 48 break to make it 6-6 at Waterlooville C.
Barry Wooley and skipper Rob Derry were on target for the home side after Heath Smith had opened the scoring. Emsworth won the first and last racks to beat Waterlooville B 8-4. Wayne Brenchley was the early winner, before home captain and league chairman Chris Hardyman had the final say. Waterlooville Allstars posted their second win at Pompey Royals to stay at the summit of group B but it was touch and go as they squeezed a 7-5 win. The experienced Colin Norton was supported by Chloe White and Steve Forster. Chad Wainwright and home skipper Dave Chivers kept the pressure on. Portchester X tried to give starts against Cowplain and failed dismally as the bottom tier outfit recorded an emphatic 9-3 success at Castle Street. Ray Steere, Will Garrett and Pete Gorvin showed great quality. 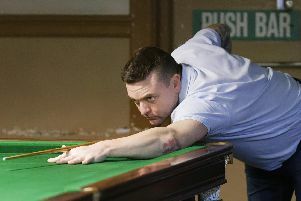 James Curtis held Neil Turp to a draw with a 31 break. Aaron Smith stole the show with a 58 break as Waterlooville A drew with Craneswater A with all 12 cueists winning a frame each. Copnor D clocked up their second 9-3 victory to lead the group C race. Oscar Rendle and Lee Rendle put Dave Glover’s men ahead. Steve Green rounded it up after some resistance from Ian Russell who drew against Jay Jobber with a handy 32. The other two matches ended 6-6. Waterlooville Butler Boys held Craneswater Z despite going four down as Ade Binding and Ian Carter missed nothing. James Williamson and Geoff Burnard made it 4-4 and the last frames were shared. Alexandra Bowls led after Matt Sheath and Phil Taylor won four frames. Then Tony Horten and Dave Wheeler levelled for Copnor Xcels.